During the renovations, I had mentioned to a friend that, once we moved in, I wanted to get chickens. I’m sure my friend was only trying to be kind but, at the time, we were only at the renovation site 2-3 times a week. 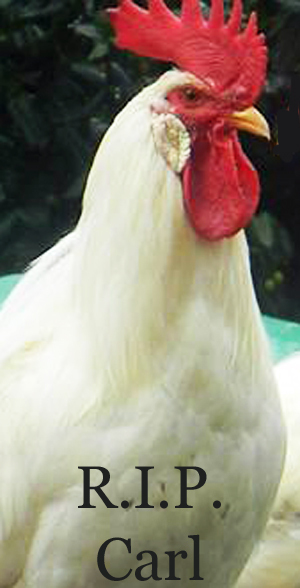 When we arrived one morning to begin work, two roosters came wandering up to the truck. I was a bit confused at first until I realized my friend had a hand in this. I called her and she said she had talked to the local “Chicken Man” and told him I wanted chickens. So, the “Chicken Man” had brought two roosters down and just dropped them off in our yard. What we didn’t know at the time was…the local “Chicken Man” raised fighting roosters. Although these were young birds (approx. 6-9 months old) and had never fought, they were from a long bloodline of fighters. We lost one rooster early on due to no chicken coop and a heavy population of coyotes in the area. The other rooster was a tough bird. He survived for several months on his own (with food/water) before we finally moved in. His name was Carl (as in Carl Jung) and he was a BIG bird. We didn’t even need guard dogs because we had a “guard chicken” on duty. Everyone was afraid of him – with just cause. The mailman, the FedEx driver, the UPS driver and anyone else who pulled into the driveway, would stay in their vehicles and blow the horn because Carl would go charging out to the driveway and be waiting on them to get out so he could flog them. We definitely had a love/hate relationship, Carl & I. But, after a couple of years, he suddenly because ill and, even though we tried our best to save him, he didn’t survive the illness. If you’ve never tried to give a chicken a shot of antibiotic into the chest while avoiding the lungs and heart – trust me – it is a hard task, indeed, you have no idea how difficult that was to do, even though he was quite docile due to the illness. Carl was the first death of livestock and a heartbreaking one for me. We buried Carl on the farm. Even though he was a danger to be around, I still miss him every day.